The countdown to Christmas has started, which means the gift buying can commence! It’s time to think about how you’re going to spoil your horse this festive season (and yourself! 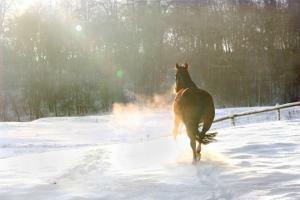 ), as our Christmas Shop has a great many things for both horse and rider. Our gift ideas come in a range of prices too, so there is something for every budget! Lincoln Herb Stix Advent Calendar: include your horse in the festive excitement with a yummy countdown calendar, complete with 24 opening windows of Lincoln Herb Stix. Hy ‘Christmas Santa’ range: the ultimate range of festive items, including a Santa hat, exercise sheet and leg wraps, this festive selection is just what you need to get you in the Christmas spirit. Likit Selection Box: perfect if your horse loves regular Likit products, the box brings together some of the most popular treats and snacks from the range, including three tasty treat bars and two bags of snacks. Lincoln Pony Mad Stocking: both you and your pony will love opening this on Christmas morning, with its exciting contents of crunchy treats, pony stickers, a mane comb and a rubber ‘I Love Horses’ wristband. Something for everyone to enjoy! HyFashion Ladies Belvoir Horse Print Scarf: the perfect accessory to your favourite outfit, this stylish scarf is both eye-catching and well-made, and comes in a selection of colours. HyFashion Melrose Cable Knit Bobble Hat: the ideal fashion accessory for cold weather. Featuring a cable knit design and detachable bobble, as well as a soft fleece lining for added warmth, this would make a great gift for someone special (or yourself!) Available in three colours. To see our full range of Christmas items for horses and riders, pay a visit to our festive shop!